Egypt has long been a land of exotic mysteries – in Desert Treasure from Playtech, the magic is brought alive in all its golden richness. This game received so much love when it first hit the internet that Playtech has even released a sequel: Desert Treasure II. But before you venture to check out its sibling, you’ll probably want to start with the classic original, featuring five reels, an array of exotic icons, 20 paylines and scope for small spins or those worthy of a wealthy sheik. 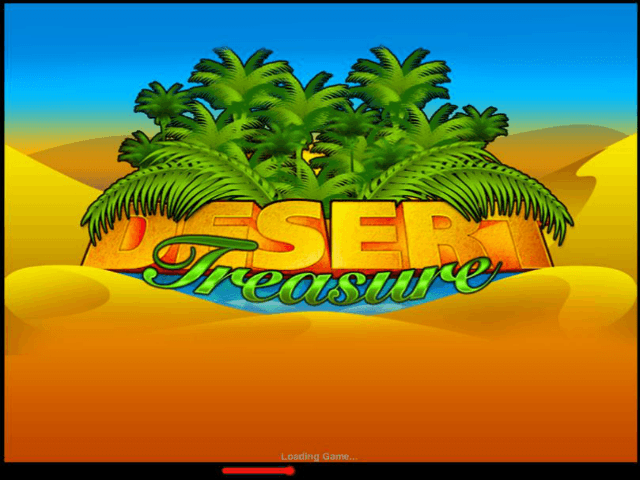 Play Desert Treasure Slot Demo for Free! Play Desert Treasure for Real Money! 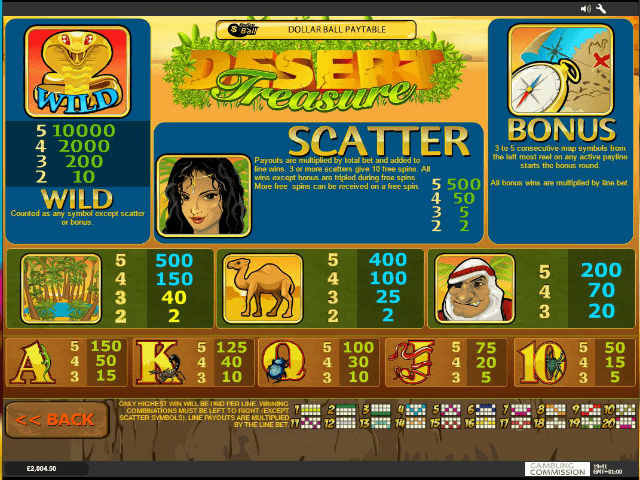 Desert Treasure slot is the original release from Playtech's Desert Treasure series. The gamescape features an adventurer atop a camel, setting off towards the pyramids in search of treasure and along the way encountering rewarding Egyptian icons, including Cobra Wilds, Egyptian princess scatters, desert oasis bonuses, camels, treasure sheiks, scorpions, scarab beetles, spiders, lizards and snakes. The game's graphics have been rendered in a cartoon style that's sure to bring out your inner child and sense of adventure. There are five reels and 20 paylines, with ten winning symbols, plus free spin scatters, wilds and a fun interactive bonus with the treasure sheik. 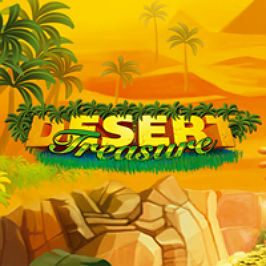 Featuring 34 basic ways to win and up to 10000x payouts, Desert Treasure has become something of a cult slot. Scorpion, scarab beetle, spider, lizard and snake icons pay from 5x to 150x for a variety of combinations. The Egyptian princess is worth a lot of camels and sought throughout the desert. Finding three or more of her icons on the reels will give you ten free spins, with 3x payouts (except for bonus symbols). You can re-trigger more free spins during the bonus. 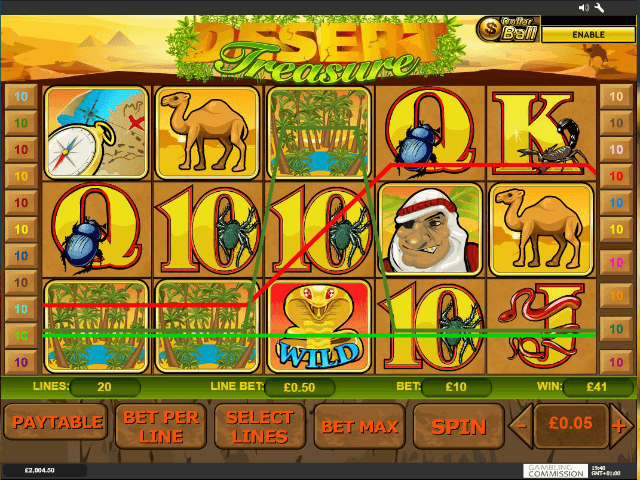 Matching three or more Desert Oasis bonus symbols on a payline whisks you away to the sheik's secret treasure trove. You'll get to select a number of items from the hoards of vases, chests and luggage and take home the cash hiding inside. Playtech's Desert Treasure slot has an exciting arcade feel, plus the timeless appeal of the mystical East, where real-life treasures can be won every time you play. If you fall for the game, then migrate to Desert Treasure II when you're ready for the next adventure. Share this Desert Treasure Review today! 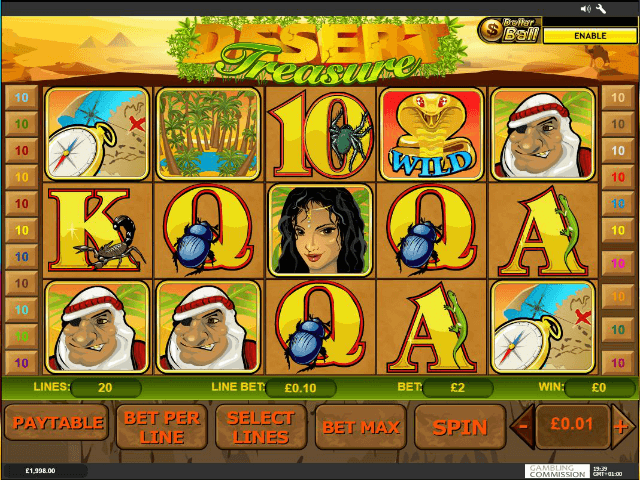 If you like Desert Treasure, you'll love these slot titles too!